We’ve all been there before. 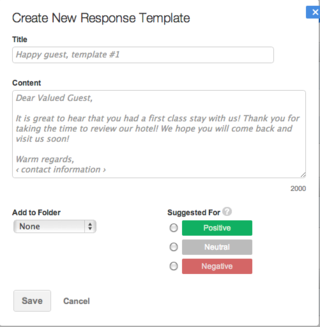 As the resident social media, public relations, guest services or reputation manager for your respective hotel, there is a requisite, time-sensitive (and time-consuming) responsibility to address and respond to the majority of consumer reviews that come flooding in about your property. In most cases, this process demands first scanning the review for specific feedback to address, then liaising with your operations team to clarify any additional feedback to include in your review response, and finally laboring over the perfect response to publish which, by its very nature, can become repetitive and fairly standardized in parts. After all, there are only so many inventive ways to thank a past guest for contributing a review on xyz review site. ‘Actions’ tab on the dashboard. Excitingly, we have taken the assistance one step further by launching a new feature that makes that final, time-consuming step of response creation just a bit easier. Organizable by folders and recommendations for different kinds of reviews, whether they are positive, neutral and negative in nature. Easy to access and personalize as you and other users prepare and submit your responses. Fully integrated with Revinate’s workflow ticketing system. When a Revinate user assigns a ticket to a team member, he/she can also recommend templates within the system as the team collectively collaborate on responses. 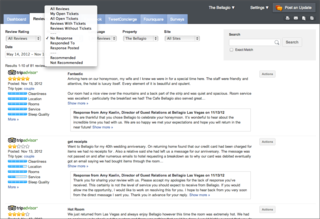 Once a few of these Response Templates are prepared and available for users, our Review Assistant toolbar seamlessly guides Revinate users through the process of selecting the right template for each respective review and also alerts our review tracking system once the review is posted in real-time so that you, as the user, know which reviews have been responded to even before the response is posted publicly by the review site. With many review sites taking several days or even weeks to post a management response, this new “Responded To” feature within the Review Assistant will significantly improve your workflow and efficiency when it comes to reputation management. While we cannot understate the time-saving value the Review Assistant will afford, these new product features, particularly the Review Templates, will not replace the requisite need for crafting customized management responses to reviews. As we’ve written many times before about responding to online reviews, a completely cut-and-pasted public response will only make your customers less likely to book. Consequently, employ the Review Assistant features for exactly what they are: aids to your reputation management efforts.